The East West Link Board of Inquiry is well under way, with the expert witness conferencing sessions winding up last week, and the hearing itself set to begin shortly. Expert witness conferencing is where experts representing the applicant (the NZTA) and submitters come together to try and find common ground and identify remaining areas of disagreement. Expert evidence has been submitted on a wide range of topics, but in this post we take a look at the economic arguments for and against the East West Link. As most readers will know, the estimated cost of the East West Link has escalated to as much as 1.8 billion dollars. We’ve previously analysed the costs and benefits of the various route options, and found that the best “bang for buck” actually comes from the cheaper options that were assessed. Using an incremental approach, the BCR of NZTA’s chosen option over cheaper options actually comes out negative. In other words, the increased benefits of the NZTA’s chosen option aren’t enough to overcome the increased cost. If Finance Minister Steven Joyce was sincere with his recent call for greater discipline in assessing the benefits of large infrastructure projects, he need look no further than the East West Link. The area is a significant employment centre, accounting for 10 per cent of Auckland’s employment in 2015. The area accommodates a large number of other major distribution and logistics facilities serving Auckland and the upper North Island. Supporting these activities and the supply chains they underpin is clearly important to the future economic prosperity of the Auckland and the upper North Island. The Project provides an opportunity to reduce travel times and improve connectivity between firms and markets locally and between regions and between workers and jobs, mainly within Auckland. This will support a range of economic benefits including increased business productivity and reduced operating costs. As employment increases within the area so too will commuting trips [by private motor vehicle] with much of the area not well suited to passenger transport. The EWL area plays an important and unique role within the Auckland and upper North Island economy as it is both Auckland’s and the upper North Island’s main industrial, transport and distribution hub. The economic contribution of the area is regionally and nationally significant, generating approximately $4.7 billion of output in 2012, or 7.5 per cent of Auckland’s total GDP and the area is a significant employment centre, accounting for 10 per cent of Auckland’s employment in 2015, second only in size to the CBD. Inefficient connections are constraining the EWL area’s growth. Through the provision of additional transport capacity, which delivers a wide range of accessibility improvements, the Project will support the growth of the EWL area and Auckland’s economy. By improving accessibility for businesses the Project will result in improved productivity and output through faster travel times, more efficient use of resources and reduced operating costs. Importantly, the EWL will work in conjunction with the operative zoning to support the development of the parts of the EWL area identified by Auckland Council as key manufacturing and transport locations with future growth potential, making the Project a real example of integrated land use and transport planning. There are obvious defects with the NZTA economic evidence. For starters, there is no attempt to quantify the benefits in economic terms, and there is no mention of the cost of the project and costs imposed on the wider community. However, at a Board of Inquiry it isn’t enough for a lay person to make these points, no matter how obvious they may seem. Submitters have to engage their own experts at their own expense. Four submitters have done just that, putting forward their own economic evidence to the Board. The Campaign for Better Transport’s evidence endorses all of these points and more, discussed further in the remainder of this post. The Campaign for Better Transport’s evidence comes from economist Donal Curtin. He takes a look at the NZTA’s Indicative Business Case, their Detailed Business Case, and provides commentary on the evidence of the NZTA and other submitters. From the Indicative Business Case, Donal highlights the options assessment. NZTA’s chosen Option F, from a purely economic perspective, was not the best option. The greatest quantum of benefits comes from Option B. On a Benefit Cost Ratio, or “bang for buck” basis, Option F is again not the clear preference. 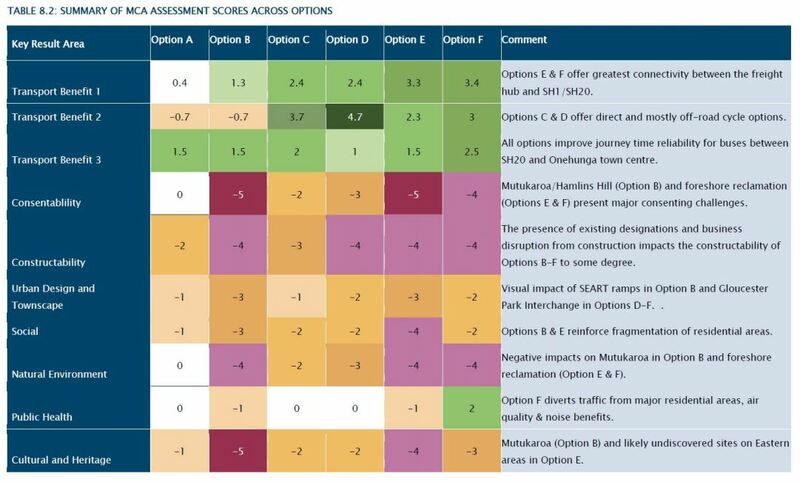 None of the options were highly effective projects when assessed against the NZTA’s own classification system of effectiveness. The MCA assessment did not spit out any obvious overall winner. Donal notes that if you simply added up the scores of the MCA and combine with the BCR, then Option A becomes the clear winner. Using a slightly different weighted approach, Option C becomes the winner. From the Detailed Business Case, published in December 2015, Donal then focuses on the updated BCR table for NZTA’s preferred Option F.
The big changes are a $200 million increase in benefits and a $125 million increase in costs. Anticipated net costs have increased as a result of the DBC refinements, and a more complete understanding of the works required. However, the increase in costs has been matched with a relative increase in benefits such that the BCR remains similar to the level identified in the IBC. Furthermore, on the basis of more recent project estimates of $1.25-1.85 billion, the BCRs for the EWC would be 1.42 (on the $1.25 billion number) or 0.96 (on the $1.85 billion number). My final comment would be that we do not appear to have the transparency around the most current calculations of benefits and costs that I would have expected to have been available at this advanced stage of a major infrastructural project. Existing economic activity within the Project area is substantial. The project will reduce travel times and improve travel reliability between firms and individuals within or across the Project area. Reduced travel times and improved travel reliability would support a range of economic benefits, including increased business productivity and reduced costs. Achieving these economic benefits would incur economic costs, including capital costs, disruption to existing activities and other opportunity costs. An economic assessment of this Project should consider both economic costs and economic benefits. Neither the December 2015 analysis nor an updated economic assessment of costs and benefits have been presented as part of the application or evidence given in support of it. What the up-to-date assessment of economic costs and benefits is for the latest iteration of the Project. The most recent comprehensive estimate of costs and benefits is included in the December 2015 Detailed Business Case. It’s worth stepping back from this detail and asking does any of this matter in the context of the Resource Management Act? Time will tell if the Board shares this view. It is costing thousands of dollars for the CBT and other like-minded organisations to submit against the East West Link. No matter how small, financial contributions are gratefully received and can be paid directly to The Campaign for Better Transport’s bank account – Kiwibank 38-9009-0281735-00. Not being an expert on boards of inquiry, I will be interested to see how much weight is given to the economic case. My suspicion is that it wouldn’t be determinative in and of itself, but might be important when considered in light of other factors. My main issue with the East-West Link is the opportunity cost. If we’re spending $1.8 billion on that, that’s a billion dollars less to spend on light rail to the Airport, or the North Western Busway, or a rail crossing to the North Shore. That’s something that might be relevant to the BoI, but they might not put attach the same significance that I do. One factor that will be important is that Option F requires considerable reclamation along the foreshore. The rules are balanced against coastal reclamation unless a good case can be made otherwise. If the court is presented with evidence that an alternative option that doesn’t require coastal reclamation provides the same or greater level of economic benefits, that might be persuasive in sending NZTA back to the drawing board. It’s definitely a concern for me that the large cost escalation in Option F was not accompanied by a re-evaluation of the other options to see if there costs had escalated to the same extent. The detailed business case was on a project costs $950 million… not one costing anywhere from $1.2b to $1.8b. My understanding is that the Board cannot reject a project based on economics. But they *can* reject a project if they feel that NZTA’s assessment process was flawed. At the upcoming election, I will be rejecting National based on economics. As a fiscal conservative, and many other NoRS are fiscally irresponsible. Agree that opportunity cost is a big factor here, what could be done with that money…but given that its from a central fund not local then the opportunity cost is for other national projects surely? which is what I don’t get about the govts stance on it – surely you could choose an economically sound option for the EW Link, and broadcast that loudly and proudly, and then with the money saved to do a similarly economically viable project elsewhere in the country and win even more votes?? its really quite bizarre. I would argue that the opportunity cost is irrelevant in any consideration under the RMA – that’s a purely political consideration. You couldn’t use any argument re opportunity cost against a private development, hence I don’t think it could be justified here. appreciate that, wasn’t really a comment on the BoI or RMA process, more just exasperation with the actions of the government and what else could be done with the money. Seems to me that by choosing the option they’ve gone for, theyre missing a political opportunity to win more votes elsewhere by progressing multiple beneficial projects, not just one massive but poor value one. Perhaps its a case of that stage you get to as a 3rd term government seeking a 4th term, that the blinkers are on? There are some disturbing comments in the “Assessment of Alternatives” link. In other words, discounted cash flow at the prescribed discount rate doesn’t give enough weight to the anticipated relative benefits of option F in future years so we will tip the scales in its favour. In fact there is no mention of BCRs at all in the document which claims to be an assessment of alternatives. I note that the report is written by a Beca employee and the “Mr Murray” referred to is also a Beca employee. The economic “evidence” presented by John Williamson seems to presume option F. It states “travel times for trucks accessing SH1 improve by up to 18 minutes (SH1 south), and accessing SH220 inproved by up to to 6.5 minutes (SH20 south).” Note the use of the present and past tenses for something that hasn’t happened and the use of “up to”. Reminds me of those late-night infomercials on the TV…and this is presented as “evidence”! performance of local road corridor and alignment options”. And so a perfect circle of unsubstantiated assertions is formed. Slightly off topic does anyone know when the Board of Inquiry will approve/decline the East-West Link? Draft decision is 22 October and final decision is due by 22 November. The board process is going at a very fast pace. This is driven by the legislation governing the board of inquiry process. There is a lot of material and it’s a big multifaceted project. NZTA has been only releasing information slowly after the submission and it is I think caused a large problem for the community. Many who do not really understand the impact on the community. Also, ask someone random in Wellington or Christchurch about CRL and you might get an answer. Ask anyone about EWL and it’s very unlike they know anything. However, this project is of the same scale and similar cost. I think it’s a poor spend/return of public money. “How the East-West Was Won”. Cue Morricone’s theme tune for The Good, the Bad and the Ugly. This biggest issue for the Board of Inquiry surely has to be that other options could achieve similar outcomes with significantly less adverse effect on the social and natural environment in the area? At least at the Onehunga, I think the fundamentals of the EWL of flawed. Ignoring arguments about opportunity of real alternatives (non-road) for two billion of public money. Fundamentally this project does not increase the size of the Onehunga bridge. Instead it increases the arrival rate of traffic to this node. Furthermore, I question the NZTA traffic models as I think the design will lead to longer queues on and off the motorway. Waterview seems to be a clear example of this type of mindset – loud claims to fix congestion, but quietly down playing the truth after the money is spent. The EWL project as it stands right now is playing the same game – “reduced transit time” = no congestion. In fact I think the opposite will occur and it will cause an even bigger conflict with the residential area. Second I don’t think the economic models account for the lost opportunity to the city for the development of the Onehunga port as a connection to the Manukau harbour. Among the many weak assumptions here is the idea that the land use in this area is fixed, there is clear evidence of Onehunga growing its appeal as a more mixed use residential/commercial place (new apartments etc) than than a hard out industrial/warehousing one. There is a great deal of status quo bias in this assumption. Cities are always dynamic, for example Grey Lynn started in the 19thC as a purely residential dormitory suburb, then in the 2nd half of last century shifted to light industry, car yards, etc, and is now shifting back to residential… It is entirely credible that Onehunga is on a similar arc now. And Panuku are even charged with making this kind of shift happen! To double-down its current use with a massive harbour edge ruining truck sewer just as these industries look like they are beginning to migrate south to new industrial zones (like Drury) and new more fit for purpose buildings there looks extremely short sighted. The assumptions of ever more industry is not supported by any evidence but is entirely relied upon as the extremely flimsy basis for selecting the massive place ruining and wealth destroying mega-option. The subtler option A type, looks the most future proofed in a world of shifting city patterns. Actually, a solution like just offering PoT a land swap further south for its inland port would almosy certainly be way cheaper. But NZTA is a road builder, not a transport solution agency. Yet all transport investment is about land use, so why do they have a wider mandate, and why are Council being so supine here…? Part of the driver is undoubtedly Metro Port. Excluding your suggested structural changes to the land use of the area – which I agree (*) – if it was just a case of transport to locations in Onehunga/Penrose, then the EWL probably wouldn’t “seen” be needed. However, the rush hour perception and cost of rolling stock capital seems to be driving the view that the only solution is more road concrete. Trying to get the debate into a boarder context is a struggle against an agency that has a singular focus and doesn’t seem to listen. (*) I have seen this, after both lived in Grey Lynn in the 90/00s and in Onehunga from the 00s/now. Christ, don’t read the comments on that one. At least it’s easy to understand why those comments are there. There are many apartments in areas which are totally unsuitable for apartments. Hobson and Nelson Street are highly visible to commuters, and looks miserable even from behind a windshield. I lived there for a while. It’s even more miserable if you actually have to walk around in that area. Apartments + junkspace is a very bad combination. There also the risk of ending up in a unit without any sound proofing. People are not making that up. Is sound proofing really that expensive, or do a few developers just don’t bother with it because they don’t have to live in those buildings anyway? This is really hit and miss, and I don’t think you can easily figure that out before buying or renting. Even within the same complex some units can be a lot worse than others. So why do these comments only ever get made about apartments? All of those things are equally true of standalone houses. It’s a real mindset issue and very good point Sailor Boy. It’s a shame as Onehunga is the perfect area for apartments. Especially if it had a nice connection with the harbour to increase the livability of the urban space. Projects like Fabric look good and maybe fix the mentioned issues. I looked at it and one thing that worried me was the cost of the body corp.
Like most things there are no clear answers and people have to invest in finding good solutions. – Standalone houses naturally have more sound insulation between each other, due to having a large air gap between units. (on the other hand, also due to that air gap, a lot of houses tend to be cold this time of the year). – Standalone houses often have a garden, and more private space inside. – Usually driving and parking a car is quite convenient. The usual suburban pattern is that you only ever leave your house inside your car, and you only get out of your car in other bubbles like malls. Those last two points means that you’re much more insulated from the street environment in those houses. Which is a big plus in most of Auckland. The prevalence of junkspace and excessive traffic engineering hits people in apartments much harder than people in houses. I disagree Roeland, we simply don’t think about the way that junkspace and traffic engineering negatively impact on standalone houses because culturally New Zealander’s consider stand alone to be the norm and apartments to be ‘other’. @roeland Actually the apartments I’ve lived in overseas have not had these problems. The sole use of garden is certain a thing. In fact it’s really the “NZ thing”. However at what cost? Grow in the city is inevitable, so land utilisation needs to be maximised. Do we expect people to live in garages, cars and under bridges? If we stay with our current model, land prices will continue to increase as more people want to live in the locations closer to the city centers. How will people thing afford to live in these locations? Only the luckily few who already own in these locations. There is also an argument about environment – living in apartments has less impact on the environment, particularly if combined with proper public transport. I don’t doubt there’s some cultural bias. On the other hand, try it out. Take a walk in Victoria Quarter. How easily can you cross Cook Street? Hobson Street? Can you find any public space or private open space anywhere nearby which is not parking? Both Victoria Park and Meyers Park are a not too long, but very unpleasant and cumbersome walk away. Auckland is built the wrong way for apartments. Refer to the last post about that ridiculous intersection in Newmarket. Auckland is full of these things. Will it change? Maybe — fingers crossed. Nobody seems in any hurry to improve Victoria Quarter, despite the population growth. Even some measly 30 km/h signs are politically totally unacceptable. In case of Onehunga, a motorway along the shore will not do this any good. Exactly one of the reasons to say NO to the EWL. Yes, I wish you the best of luck. The last pictures in Part 1 of your post sum up this problem perfectly. I agree with you all. NZ apartments could be great. And aren’t. Overseas my apartment blocks had communal washing lines – not rules about clothes horses on the balconies being banned. They had secure places for bikes – not rules about bikes not being allowed in the public areas. They had wide, warm, light stairwells right in the best place as you come in the door, allowing for friendly conversations between residents (and a slow lift for furniture) – not a fast, energy-consuming lift in the best place as you come in the door, in which you don’t look at anyone (and a dark, narrow, cold staircase somewhere at the back). They had basement storage units for things like skis and suitcases – not balconies facing a motorway that might as well hold that stuff because it’s too unpleasant to be out there. Apply the same argument to literally any suburban development. Except, Sailor Boy, that if you have a car-based transport system, the city centre becomes a highway interchange, and quite unliveable. Cities either change their focus to PT, or they give up on the central city being a good place to live. dr has given good examples in his Vitoria Quadrant articles of good amenity in new suburban developments. Well the NZTA tried the “There is no alternative” [as they say here for Option F] for the options they chose for both Basin Reserve Flyover and the Puhoi to Wellsford tolled road (the so-called [Steven Joyce Memorial] Holiday Highway). The BOI shot down NZTA over their flawed analysis of the alternatives other than the chosen option of the flyover, and this is why they eventually lost that case [an decided not to to appeal the BOI decision]. The BOI in the Puhoi to Wellsford case swallowed the NZTA’s line hook line and sinker and approved it. Basically they said if I recall that the Government [via NZTA] can decree any important project as a National priority and so it will happen regardless of economic analysis or not so they let it go through as is. So thats 1 for 2 to NZTA with BOIs. On the balance of things, you’d think this BOI would come down against the EWL like they did with Basin Reserve flyover due to lack of evidence showing the process that picked option F was not flawed. However, if they take the same approach as the BOI did for the Holiday Highway, then all bets are off. As I see it its all coming down to a political decision not an economic one. As Joyce clearly wants it to happen. But what may sway the BOI is the amount of reclamation option F requires. But then NZTA will simply argue [citing the local “environmental” outfit “TOES” along the way] that as its a degraded environment from past industrial pollution, reclaiming it is in fact the best way to improve the environment. [A kind of “I must burn this village down to save it” argument used to justify the unjustifiable during the Vietnam war]. I think at this stage its a line call which way it could go. I hope they take the Basic Reserve apporach and call out NZTA over lack of transparency and flawed evaluation processes. Because for all we know, this may well be the best outcome of the 6 or so put forward. But based on what NZTA has released so far, its not looking likely at all. But without all the facts put in front of the board how can we [or the BOI] really know and make a informed decision? A good economic analysis focuses on utility and assigns values to these multiple-criteria, thus reducing everything to … wait for it … an economic perspective. When we use “economic” to mean “financial” we are misusing the word. They missed me and they have now added me to the schedule. If you haven’t previously reconfirmed and you still wanted to present, you may still have a chance. Option F was chosen because it offers the greatest benefit to the New Zealand Trucking Agency. It seems as if this project was thought up in a room, and then the NZTA commissioned to implement it. MFD – It is almost certain nuts have been involved in the production phase. Thanks for taking the time and effort to go through this road project in detail. It deserves scrutiny. It is reasonable that guidelines do not permit abandoning projects on purely economic grounds. Yet we must remember what the economics represent. Lesser benefits mean less time saved, more greenhouse gases emitted by vehicles, and fewer jobs created or preserved. These area all bad community outcomes. 1. The recently advised cost escalation from $955M to $1.25B to $1.85B (assume P50 is now $1.55B) is +62%. This is far beyond the current inflation rate (+0.4% per annum) or even the outrageous Auckland construction cost inflation rate of +6%. As planning estimates are normally supposed to include risk contingencies of up to 30%, this cost increase is well beyond what is normal or expected. As others have said, with the correct cost included for Option F, the project would not be economically viable. – assumptions of economic uplift from the project may be unfounded. Wider economic benefits (WEBs) are normally found in urban projects for improved access for commuters to job centres (i.e. CBDs) or for freight vehicles to ports and airports. Neither appears to be the case for this project. From research in other jurisdictions, there is little evidence that urban freeway-type roads generate WEBs in practice. – expanding capacity of the road system is likely to induce addition car travel (VKT) that will eventually add to congestion on both this and other roads. With the high degree of traffic congestion in Auckland roads now, induced demand is highly likely. This means that net amount of vehicle travel, and motorist delay, may increase from the project. NZTA needs to explain how the project assessment has allowed for induced demand. – expanding road capacity and speed is likely to encourage further urban sprawl of Auckland. This will result in many social and environmental costs, due to increased travel time, increased land and resource usage, and difficulty in servicing the enlarged urban area. Although the road is justified by freight travel, it seems clear that the bulk of the road capacity is being provided for commuter trips, contrary to overall AT transport planning policy. – The Penrose area is home to industrial businesses, but most of these are focused on domestic demand (i.e. Auckland region). In the absence of any major exporters or trade exposed industries, the project benefits might only relocate businesses from one part of Auckland to another. – The Onehunga area is redeveloping as a residential area. Intrusion of a high volume through traffic facility will adveresly affect amenity, and discourage residential redevelopment. – community disruption during construction from traffic delay for motorists from construction roadworks. Delay during construction should be calculated and added to the impact assessment. Road project benefits are typically calculated for a 20 or 30 year time period. If the project induces significant delays for a 2 or 3 year construction period, this represents a measurable proportion (10% to 20%) of the project benefits. Hence these may be overstated by 10% to 20% by omitting construction delays. From a land use planning viewpoint, consideration should be given to the balance of land areas that are made more and less viable for development by the project. Option F will sever large areas of the Manukau Harbour waterfront from adjacent suburbs, and make residential redevelopment of it and Onehunga unlikely. the question is not whether industrial activity in Penrose will justify the project, but whether it will exceed the potential drop in residential and commercial activity in Onehunga the project is likely to cause. Apologies for the diatribe. Good luck to the objectors. If the approval process is to have credibility, projects like this should be refused in my view. I’m confused. Shouldn’t this be rejected For environmental reasons rather than economic ones? You can barely build a house in Auckland due to the RMA, but the NZTA can build a motorway right next to the harbour! Remind me which is worse for the local environment again? spot on – I have seen Council decline a new house because it would cause adverse effects to “residential amenity” that could not be mitigated. The design infringed a HIRB by 15cm and could in theory enable the conversion of part of the house into a stand alone unit ….. shock horror. Sorry where do environment issues fit in? Our oceans are polluted; streams that have not dried up are a disgrace; the government advocates that we buy electric cars while largely not buying them themselves. Where is the coherent plan to meet green house emission targets? Or for that matter any sort of plan? My very favourite from this week is that Minister Roads and Bridges believes that he can fix Auckland’s congestion problems with a mix of shared taxis and car pooling. I am struggling to comprehend that he did not suggest taxis parked up at night might be a solution to the housing crisis -I guess its not his portfolio. Oh God, I missed that. Yes, he might as well offer the buses too. They could house people at night. In fact, the ones used for the peak trips could house some of the split shift workers for a nap during the day. I deleted my comment because it went in the wrong place again. This problem seems to arise whenever I copy and paste. 3. NZTA have presented the results in a way that pushes their agenda. “68% agreed and strongly agreed that the East West Link will improve transport options. 70% agreed and strongly agreed that the new shared path for cyclists and pedestrians between Onehunga and Sylvia Park will improve access to the area. 43% agreed and strongly agreed that when finished, the East West Link will improve Onehunga town centre, while 18% disagreed and strongly disagreed and a further 39% didn’t know or were neutral. 13% agreed and strongly agreed the East West Link project will enhance the water quality in the area, whereas 33% of respondents didn’t know. 11% felt they needed more information on the project. 7% felt the project would increase traffic in Onehunga. If 13% agreed and 33% didn’t know whether the project will enhance water quality, it implies that 54% think it will degrade water quality, but this is deliberately not stated. 2. The wider environmental impacts of the project, noise, destruction of the foreshore etc? 3. Whether they actually support the project etc. All this only increases distrust of NZTA and combined with the fact that they are having to deliberately present the information this way only further shows that they know the project does not stack up, but they don’t want to admit this. Where is the question about making traffic congestion worse? Economics or not, as a regular user of that section of road – Sylvia Park to SH16 – I am looking forward to a new direct link – it should have been done ages ago. At some times of the day it takes anything up to an hour to do that stretch of road. Have to do that two or three times a day and there goes a lot of time just sitting in traffic. Not so bad going west to east simply because Sylvia Park Road and Great South Road are by- passed. An hour to drive along Church Road? Hyperbole much? A new direct link to Sylvia Park from Onehunga will be great for the first 5 years then you get grid lock at rush hour that lasts longer and longer as the population of Auckland grows. Try taking the South East motorway from Onehunga East as it crawl up the hill from the sea. I think a solution may be to separate the heavy vehicles from the agile vehicles, due to big differences in acceleration and braking time and distance. Send trucks along the EWL, and light vehicles along the present road. Without trucks on Neilson/Church/GSR/Sylvia Park/Mt Wellington, light vehicles would be a lot faster.